I’m a huge huge fan of cheesecake in all its forms but had never even considered the idea of turning it into a real cheesey salty affair until I was reading one of my Christmas presents, Honey & Co. – Food From the Middle East. (A brilliant book which is well worth checking out if you like Middle Eastern food). Anyway when I spotted their Savoury Cheesecake I just had to try it. We had it for Sunday brunch and I remember wishing I had made more. The texture is surprisingly light, almost like a souffle. And the salty cheese makes it so so satisfying. It’s super delicious here with the roast zucchini but feel free to use any of your favourite pizza toppings to top it instead. I’ve also made it with chunks of roast eggplant. Yum! I love this cheesecake so so much. I’ve served it multiple times for brunch but it’s also fab as a simple vegetarian weeknight meal. I like it best when still warm from the oven but am totally happy having cold leftovers for lunch the next day. If it’s not zucchini season where you are, see the ‘variations’ for alternative topping ideas. 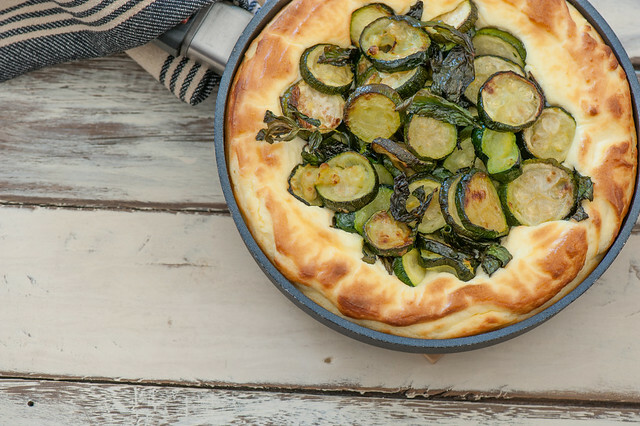 And if you’re short of time you can easily roast the zucchini at the same time you cook the cheesecake and then serve it on top. 1. Preheat your oven to 200C (400F). Slice zucchini into rounds and pop in a roasting tray. Drizzle with a little oil but don’t add salt because you’ll be getting lots from the feta. 2. Roast for 20 minutes or until zucchini has softened and started to brown. Remove from the oven and toss in the mint. 3. Meanwhile, place cream cheese, feta and eggs in a food processor and whizz until well combined. There will still be a few tiny lumps from the feta. Grease a 20cm (8in) oven proof frying pan or spring form pan. Spoon the cheesey mixture into the pan and smooth out the top. Press the cooked zucchini into the top. 4. Bake cheesecake for 15 minutes. Turn and cook for another 5-10 minutes or until browned around the edges and puffed up a little. Serve warm. 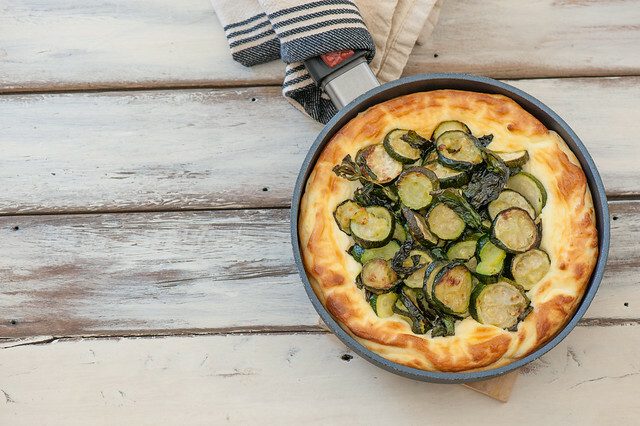 short on time – bake zucchini at the same time as the cheesecake and serve on top. Or skip the zucchini and just serve with a side salad for greenery. Or try a big dollop of pesto just before serving. different veg – roast eggplant is really good, grilled red peppers, roast mushrooms, roast diced root veg like sweet potato, wilted greens. carnivore – top with salami or proscuitto as well as or instead of the zucchini. no food processor – just mash the cheeses and eggs together with a fork and go for a more chunky, rustic style. different cheese – replace feta with goats cheese or ricotta. more substantial – serve with a side of bacon and/or hot buttered toast. For a more middle eastern vibe serve with warm pita bread. + 16 Tasty Ideas for Zucchini. Wow! I needed something relatively quick to do with the eggplant we got in our farm share and of course went to your blog for a healthy, simple, yummy, no-nonesense recipe. After reading this post and browsing the variations I went with a savory cheesecake (only about 3oz feta), fried eggplant (not enough time to bake properly), fried salami, and parsley (didn’t have mint). Since I lacked feta I added extra salt. When I constructed it I added black pepper and still felt something missing so in a whim I added cinnamon (some part of my brain remembers some middle Eastern eggplant with cinnamon). What I ended up with was something really different than usual (savory, tangy, spicy, sweet, warm, and fresh), but which had it’s own logic. I enjoyed it but my partner who doesn’t usually eat dinner (wtf, right?) commended it and had seconds! This is my first comment. I just love your blog and really took some risks tonight inspired by what you offered. My favorite part about what you do is the variations because they’re SO practical and really help to get my own creativity flowing. (Since I can’t attach a photo just imagine fluffy cheesecake, heaped with cubed browned eggplant, and a sprinkle of parsley and cinnamon, topped with 2 cm think strips of slightly crisped salami on top). Love your creativity – brilliant to use the cinnamon. This is a must-try. So healthy and I’m pretty sure delish! I love zucchini and cheese separately. Did’t know they would be a good match. Can’t wait to try this. Thanks for sharing. Love this! I made this for dinner on the weekend and have had it for lunches the last couple of days. I topped it with a roasted mix of zucchini, sweet potato and tomato. Amazing. I have both goat cheese and ricotta in my fridge, so I’m already planning another one. I am about to make this, and can’t figure out how to turn the cheesecake after baking for 15 minutes. Do you mean to turn the pan 180 degrees? Or flip the entire thing over?